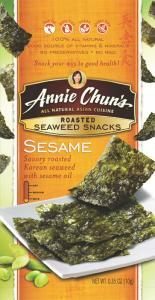 Recently, a friend of mine introduced me to Annie Chun Seaweed Snacks, which she was eating like chips. I had never heard of snacking on seaweed before, but these seaweed papers were super delicious (if you like the taste of seaweed), and also super healthy too. There are currently two flavors: Sesame Seaweed and Wasabi Seaweed. I love snacks that are a bit different from the “norm” because they allow you to mix it up a bit in your diet – to avoid becoming bored by eating the same thing day in and day out. Seaweed is actually one of the original super foods; it is packed with minerals and vitamins. I love that seaweed has been consumed for thousands of years by people from all around the world. In some form or other, it is thought that seaweed has been in existence for at least 3.5 billion (yep, billion!) years. We know that the Japanese have eaten seaweed for two millennia now. By the year 800, there were six types of seaweed that were eaten in everyday Japanese cuisine. Around the 790s, the Japanese began to use seaweed to produce nori, which is actually a sheet of dried seaweed. Now, how do they taste? I’ve tried both flavors, and I must say that I am partial to the Wasabi, but I really like both of them. The Sesame flavor has 25 calories per ten sheet serving while the Wasabi has 30 calories, at just 1 weight watchers point plus point. Both are loaded with vitamin A, but if you are watching your sodium intake, the Sesame flavor has more salt, so make sure you read the label carefully. PS. If you are into Japanese food, check out my previous posting on low calorie sushi ideas. Are these super thin or cracker like? Just wondering if I could use them for dip. thanks! I love seaweed snacks and it's my favorite new way to munch out now. If you haven't tried... SeaSnax at Whole Foods Market is by far the best tasting one out there with more seaweed and less packaging. They sound like a very cool company too.